I tend not to have good associations with churches. My relationship with religion and its structures (of all kinds) is complex but predominantly negative, full of links to feelings of guilt and boredom. But recently, I’ve often chosen to visit our Cathedrals. This has nothing to do with religious awakening, but more to do with the buildings being put to wider purpose in an increasingly secular age. 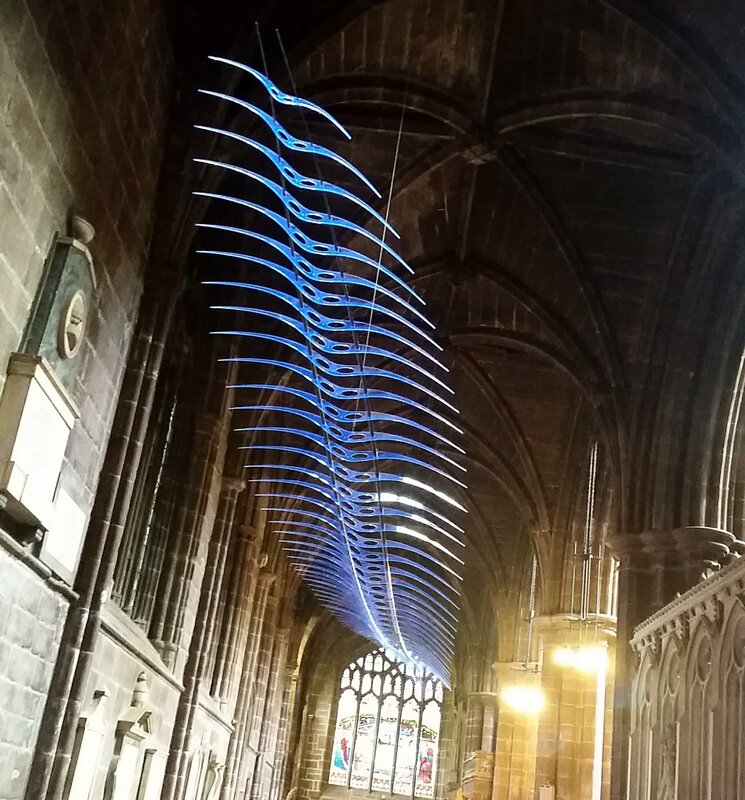 Thus we’ve had the Winter & Summer Arts Markets and film nights in the Anglican Cathedral, the Liverpool Mass in the Wigwam – and now, in Chester Cathedral,the ambitious ARK. The most initially striking aspect of ARK is seeing modern, contemporary sculptures in this ultra-traditional space. The placement of modern pieces is carefully planned, amusing and surprising. Finding a thoroughly modern piece such as Joe Rush’s War Horse sitting on a centuries-old altar is at first a shock, and it works. How many times have you wandered round a Cathedral in admiration of the sheer scale of detail, but unable to really take all of it in? ARK brings details like the equestrian theme behind War Horse, which you may not otherwise notice, into focus. It also makes you investigate the whole of the building – making sure you don’t miss anything feels something like a treasure hunt. But ARK is not a successful exhibition simple because of this trick of display. The sculptures selected are strong enough to work as a show in any gallery. Barbara Hepworth & Damien Hirst are probably the most familiar names here, but there’s quality work everywhere you look. Hosting an exhibition in a Cathedral certainly seemed on my visit to be ticking one of my big approval boxes – exposing a different audience to art. 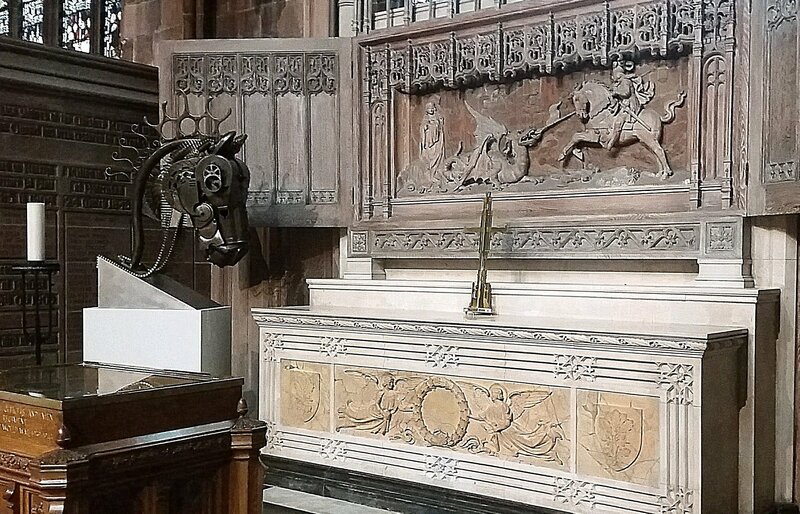 The visitor demographic in Chester Cathedral on a Tuesday morning was pretty much the holiday-makers and retirees you may expect it to be. And of course, “modern rubbish” and various other derogatory remarks were overheard more than once. But with an exhibition featuring 90 works, there’s bound to be something here for every taste. For example, in the centre of the Nave we find Angus Fairhurst’s The Birth of Consistency – a rather roughly rendered gorilla, staring into a mirror in apparent questioning of his own existence. 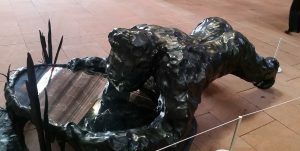 Another gorilla looks on from nearby – Ralph Brown’s The Patriarch Jambo, more realistically rendered to emanate strength. Which one is more to your taste either artistically or metaphorically is of course up to you – but you should find yourself admiring at least one. It’s noticeable that ARK’s Cathedral setting puts a certain interpretation on many of these pieces. I doubt that many of these sculptures were created with explicitly Christian intentions and yet here, you can’t help but notice how they reference religious themes – undoubtedly a factor in them being chosen. Even a zebra (or three) becomes a reference to the Ark and all the baggage of that story. I suppose that whether you agree with religion and its power structures or not, the fact is that its concerns are often the concerns we all share. Life, death, love purpose, community. The concerns which fill out a narrow life – and the core drivers of much great art. ARK is a reminder of what meaning art can project – and give you a few hours of physical discovery too. 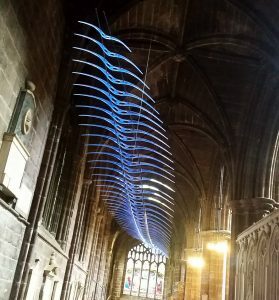 This entry was posted in Exhibitions, Home, Past exhibitions and tagged art, building, Chester, modern, religion, sculpture. Bookmark the permalink.